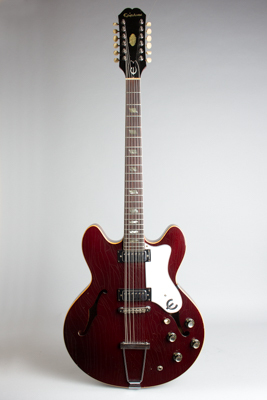 Epiphone E360TD-C12 Riviera Model 12 String Semi-Hollow Body Electric Guitar (1967), made in Kalamazoo, Michigan, serial # 878538, sparkling burgundy finish, laminated maple body, mahogany neck with rosewood fingerboard, black hard shell case. The Epiphone Riviera C-12 string may be one of the less well remembered electric 12's of the 1960's, but is an excellent design and one of the better instruments of its kind. Generally it is the same as the 6-string Riviera, with only a non-vibrato 12-string tailpiece and a longer headstock to distinguish it. The Epiphone mini-humbucking pickups are actually quite suited to a 12-string format, and compared to the similar Gibson ES-335/12, this guitar is crisper and clearer-toned, while still being capable of cranking up to breakup level if desired. This fairly rare example is finished in a very dark version of the "Sparkling Burgundy" lacquer finish used by Gibson specifically around this period, and appears more purple than most. This is a cool and very useful electric 12, the favorite of at least one player -- Carl Wilson of the Beach Boys used a sunburst example of the Rivera 12 for many years in the 1960's and 70's. Overall length is 44 1/2 in. (113 cm. ), 16 in. (40.6 cm.) wide at lower bout, and 1 5/8 in. (4.1 cm.) in depth, measured at side of rim. Scale length is 24 3/4 in. (629 mm.). Width of nut is 1 5/8 in. (41 mm.). Clean overall with some moderately heavy checking to the finish. The finish overall shows some dings and chips with one noticeable gash in the back of the neck around the 10th fret. The hardware is original except for a new repro Tune-O-Matic bridge and the pickguard is a modern reproduction. A good player and a fairly unusual -- and great sounding -- electric 12-string. Excellent - Condition.